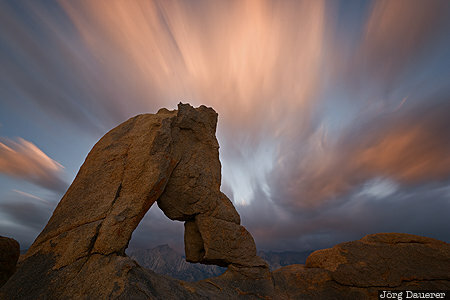 Fast moving sunset clouds (made visible by using a 40 second exposure time) above the natural arch Boot Arch in the Alabama Hills with the peaks of the Sierra Nevada in the background. The Alabama Hills are near Lone Pine in the east of California, United States. This photo was taken in the evening of a cloudy day in October of 2016. This photo is part of the exhibition Moving Clouds (February 2016). This photo was taken with a digital camera.